As humans, we love to look back on our history and examine the events and individuals that have brought us to the present day. Inevitably, when we look back at these moments, we ask ourselves, “What if the course of history had taken a slightly different path?” It’s hard not to wonder if everything is predestined, or if each decision can set off a chain reaction altering the way the world progresses. For this week’s CMON Feature Friday, we’re taking a look at how our history shapes the games we play, and how we create new ones by playing them. If you think of most wargames, they are set in a time in history that actually existed. They are usually based around a war or battle for which we already know the outcome. Playing games like this allows us to relive those moments and perhaps cause a different outcome to occur. For the current generation, so far removed from the realities of those wars, it can be really interesting to see what different tactics or strategies will result in. There is a different type of historical game that pulls its influence from different time periods, but sets them in an alternate history that never existed. This gives the creators a freedom to ask interesting questions about a history we’ve already learned. This idea of alternate histories is not limited to the board gaming world. One of the most famous alternate history writers is Harry Turtledove. He has written several series of books which pose questions like what if the South had won the Civil War, or what if 85 million years ago, the east coast of North America had broken off creating an eighth continent, or what would happen if midway through World War II, aliens had invaded the Earth? Another popular type of book combines alternate history with literature itself, featuring titles like Pride and Prejudice and Zombies, or Sense and Sensibility and Sea Monsters. This series takes classic novels set in real historic periods and throws in movie monsters to spice up the action. It’s a comedic approach to looking at a time in history in a different way. Some recent CMON games have taken a look at historic periods and asked, what if this was just a little be different than the history books told us. In The World of SMOG: Rise of Moloch, the British Empire has taken over the world and Queen Victoria rules with an iron fist. The game is set in London in 1888, but it’s a much different place than the history books show us. The dead have risen to provide inexpensive labor, mutated monsters live in the sewers, and an evil cult looks to summon and ancient fire demon. Though the foggy streets of London may seem familiar, the denizens of this alternate history include werewolves, arcanists, and circus freaks. Rise of Moloch is a steampunk version of Victorian England that introduces some incredible new characters and situations that never were. The Feudal period in Japan was a time of conflict and upheaval, as different groups fought for control of the nation. In Rising Sun, players get to take control of one of those competing Clans, but with a few twists that won’t be found in history books. Probably the most significant is the existence of mythological monsters that Clans can call upon to fight on their side. While these creatures existed in legend, Rising Sun lets players go onto the battlefield with them at their side. Players can also visit Shrines and gain the favor of Kamis. These ancient gods, bestow powers on the Clans which pay homage to them and give them an advantage in the war. This fantastical approach to the game may take some liberties with history, but it tells an engaging story in the process. War was a pretty common occurrence in medieval times. However, back then, the worst you had to worry about was getting run through by another human. In Zombicide: Green Horde, you have to worry about Orcs and Goblins attacking your villages… oh, did I mention they were zombies? Medieval times are fun to look back on and wonder, what if dragons and magic and monsters were all real? How different a world would it have been? This cooperative adventure places heroes in the midst of an outbreak of monstrous proportions and makes them complete their objectives together. 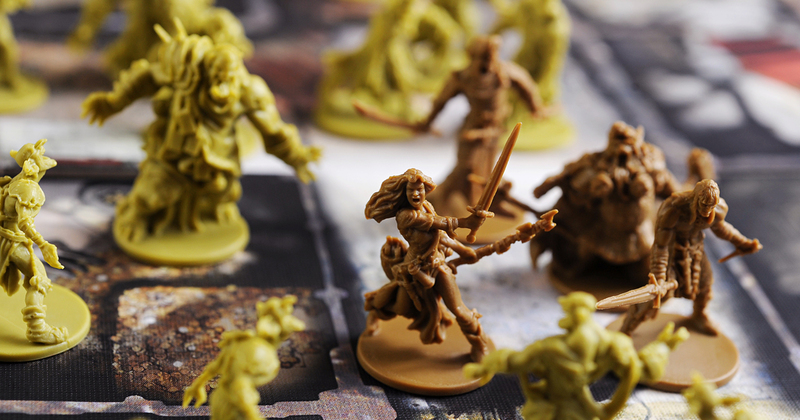 Orcs and magic might not have existed, but in Zombicide: Green Horde, you can have a heck of a lot of fun pretending they did. Alternate histories in games allows players to explore periods in the past in a different way than how they actually existed. Each time you play, the history will shake out differently and you can imagine how the world would shift with those results. What are your favorite alternate history games? Reach out to us on Facebook and Twitter using the hashtag #CMONFeatureFriday to let us know.